Honda owners joining the balik kampung exodus for the upcoming Hari Raya celebrations take note. Honda Malaysia is offering a free 22-point car inspection at selected PLUS highway R&R stops. A chart showing exact location and timing is below. The inspection will cover fluid, basic function, system and exterior sections, and will take from 10-15 minutes per car. Note that it is just an inspection, and no repairs will be done should any be required. A full list of what the inspection includes is below. 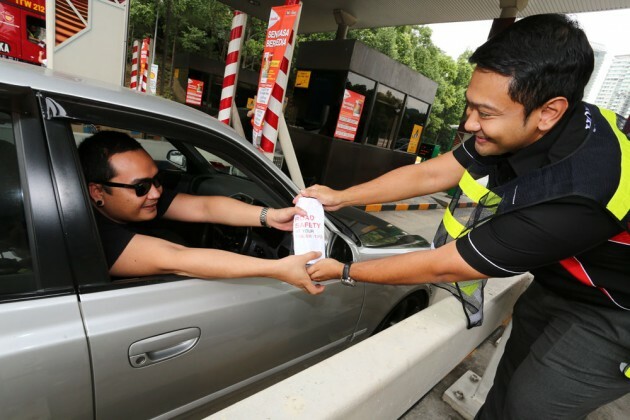 Recently, Honda Malaysia staff handed out safety leaflets with highway emergency contact numbers, bottled water, mints and dates to motorists at Sg Besi and Duta toll plazas. The ‘Road Safety At Your Finger-Tips’ leaflet uses illustrated visuals to convey safety tips for both before and during a road trip. Does it applicable to my 20 years-OLD EG8? Don’t think it covers even my 8 years old DC5. that dude in car not balik kampung..must be go clubbing or something…..and that ugly ear piercing..